René (M.) B.M. de Koster is a professor of logistics and operations management at the Department of Management of Technology and Innovation, Rotterdam School of Management, Erasmus University (RSM). Professor de Koster's research interests are warehousing, material handling, container terminal operations, behavioral operations and sustainable logistics. René de Koster: "Research into such areas as warehouse design, storage methods, route optimization, order collection, picking zones, etc. has substantially increased in recent years but there is still tremendous potential for combining the above-mentioned sub-areas". Piece picking or picker to part method: The order picker moves to collect the products necessary for one order. This is a simple method of order picking which requires sending an employee around the warehouse with an order list and a box or container. The picker pulls each item, following the most efficient route. This is not the most efficient method. Zone picking method: Each order picker is assigned to one specific zone and will only realize order picking within this zone. This order picking has each worker in charge of a section and pulls from her section to fill incoming orders. The box may move through several sections until the order is complete, often along a conveyor belt. Wave picking method: The order picker moves to collect the products necessary for several orders. Sorting systems method: There is no movement of the order picker, the products are brought to him by an automatic system (i.e. a conveyor system, automatic storage ...). Pick to box method: no movement of the order picker, the picking area is organized so that there are a number of picking stations connected by a conveyor. The order picker fills the box with the products from his station and the box moves to the other picking stations until the customer order is complete. Touch items once: Focus on preventing errors during picking and you won’t need further repacking, or shipping checking. Picked inventory should go on trucks touched only by pickers. Also pick into shipping cartons instead of tote. Rely on system verifications: Design your standard operating procedures to double-verify almost every step in the picking process. You can loosen this later as needed. For example, utilize area’s pick verification flags to have user scan and verify LPN, quantity, item, etc. Count Back or Count Near Zero can also be used to count remaining inventory in a location in-line with picking. Consider different storage strategies: Different storage strategies can boost efficiency within a warehouse. For example, slotting may improve storage intensity, reduce accidents or product damage, reduce congestion and improve retrieval times. Review storage strategies on a regular basis in order to align your practices with seasonal demand. Create a warehouse within a warehouse: You can gain tremendous efficiency by grouping together the 20 percent of your SKUs that complete 80 percent of your orders. This cuts down on travel time for your pickers. Be sure, however, that the 80/20 area or zone is properly designed to accommodate high-volume activity. • Zone picking: Each order picker is assigned a specific zone and will only realise order picking within this zone. Consider automation: Order pickers spend about 60 percent of their time walking product or moving product around. Consider an automated solution, such as conveyance, to reduce their extensive travel time. 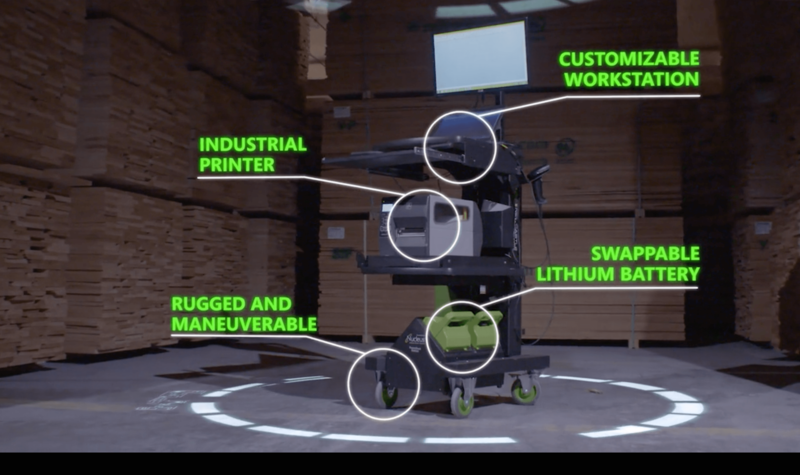 Add workstations with power to eliminate wasted steps. 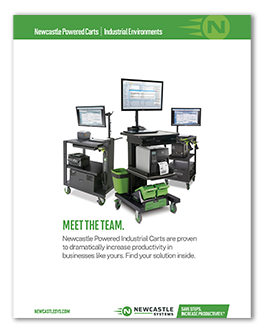 Newcastle Systems manufactures mobile carts with power to eliminate wasted steps. Mobile workstations continue to improve the productivity and deliver ROI. Download the case studies here to learn more.